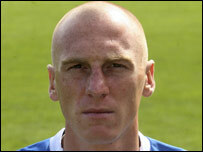 Stockport County have agreed a deal with Chester City to bring Kevin Ellison back to Edgeley Park. The 28-year-old winger is expected to arrive on loan until the end of the season, before signing a permanent contract in the summer. Football League clubs can sign players on loan once seven days have elapsed from the end of the transfer window. Ellison originally joined Stockport in November 2001 and went on to make 52 appearances for the Hatters. He is currently serving a three-match ban after being sent off in the 4-0 defeat by Rochdale on 29 January. Chester hope to replace Ellison with former Cardiff and Stockport winger Kevin Cooper, 32, who is due to hold talks following his release by Cardiff last week.